Cart noodles, which is otherwise known as 车仔面 (che zai mian), is one of Hong Kong’s iconic dishes which got its name from being sold from independent street carts in the 1950s. 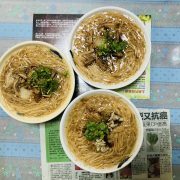 There are hundreds if not thousands of smalls shops all around Hong Kong that specializes in cart noodles, but I would like to introduce to you this particular restaurant in Yau Ma Tei opened by Kitty Yuen, a Hong Kong DJ, television host and actress. Traditional cart noodle shops are often housed in small and dingy shops but Mian Mian Dian aims to change that perception. The restaurant spots a black exterior and clean stylish modern interior with ample lighting, space and air-conditioning. The beauty of cart noodles is you can fully customize your cart noodle from the soup base to the noodles to the ingredients. There are four soup bases to choose from: satay (沙爹), spicy soup (劲辣汤), ginger wine soup (姜酒汤)and clear soup (清汤). I have only tried the clear soup and I am absolutely in love with it. Made by boiling fish bones, pork bones, prawn shells and chicken bones, the soup is clear and fragrant with a slight sweetness that is really addictive. I just can’t get enough of their homemade chilli sauce. There is red chilli, garlic, ginger and pickled vegetables inside. It is not very spicy but the salty-sour-spicy concoction complements the soup and noodles perfectly. There are altogether 48 ingredients to choose from, at HK$8 – HK$12 per ingredient. Many of the classic favorites are in the list such as wheat gluten and rice cakes. There are hundreds of combinations involving different soup, noodle and ingredients, you can enjoy a different bowl of cart noodle here without repeating for months. There is a set where you can choose your choice of noodle, soup and 4 ingredients for HK$46. Top-up HK$3 for soy milk, top-up HK$6 for hot/cold drinks or top-up HK$10 for special drinks. The prices are reasonable, the shop is clean and cool and the staff are some of the most hospitable ones I have met in Hong Kong. They will try to answer your questions as much as they can even though they are not very good in English. If you are looking for a place to have some Hong Kong cart noodles, I recommend Mian Mian Dian.